When you scraped the images, you get only the URLs in the listing. You probably want to download then now and choose Export → Save Images to Folder. A dialog as seen above will appear with a lot options on how to name the file or use filters. Folder: obviously you specify the folder where the images should be stored. Apply Filter: if checked, you get asked what filter to apply. Save Format: in case you want to save them all in a different format than the original you can specify that here. However keep in mind that any save in jpg or even gif might lower the quality. PNG format can get very huge. 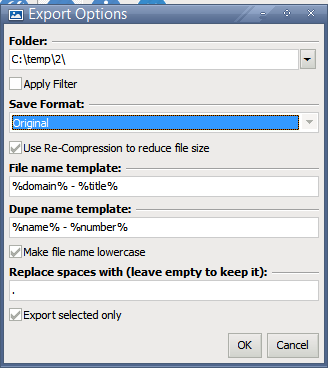 Use Re-Compression to reduce file size: the program makes use of the excellent Efficient-Compression-Tool by Felix Hanau. It can reduce the file size of PNG and JPG files without quality lose. However, the re-compression might take a lot time for big files. Dupe name template: in case the created file name as above is the already used by another image, it it trying to change the name to the one you can specify here. Make sure you use %number% here in any case. The macro %name% refers to the File name template. Replace spaces with: all spaces can be renamed to the specified charater. Leave it empty to not change it. Export selected only: In case you have one or more image selected, it is asked if you want to export that only. Quality/Compression: the quality of the image when compressing. You should use something from 75% to 95% here. Remove ExIf Header: Jpeg images can have headers in it that are not required for the image itself but offer other data like a thumbnail or camera details. You can remove that usually to save some space.